What does it take to build a Habitat house? People in your community and all over the world partner with Habitat for Humanity to build or improve the place they call home. In fact, Habitat is the largest privately held homebuilder and regularly ranks as one of the top 20 homebuilders in the United States. But what exactly goes into building a Habitat house? A whole lot, as it turns out. It takes future homeowners, who put in between 250 and 500 hours of sweat equity working on their homes and those of other homebuyers. It takes dedicated volunteers who give their time and energy so other families can have an opportunity for a better life. It also takes the support of our generous donors, both those who make financial contributions and those who give materials. The average Habitat home in the U.S. — a 1,200-square-foot house with three bedrooms — takes 150 pounds of nails and 400 two-by-fours. Many materials are provided with gifts and in-kind donations from our corporate sponsors. Contributions large and small continue to make a difference, and we believe there is something every company can give. 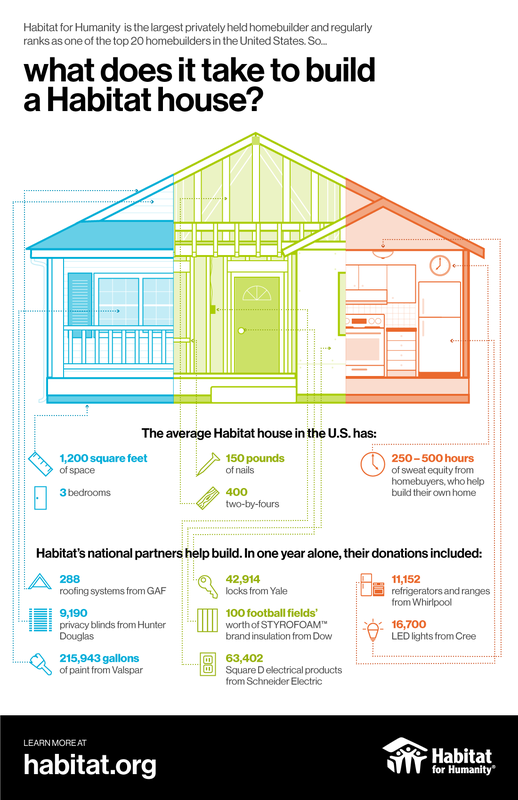 So what does it take to build a Habitat house? It takes every one of these things — and you! Learn more about gifts-in-kind donations and find more ways to get involved with Habitat.